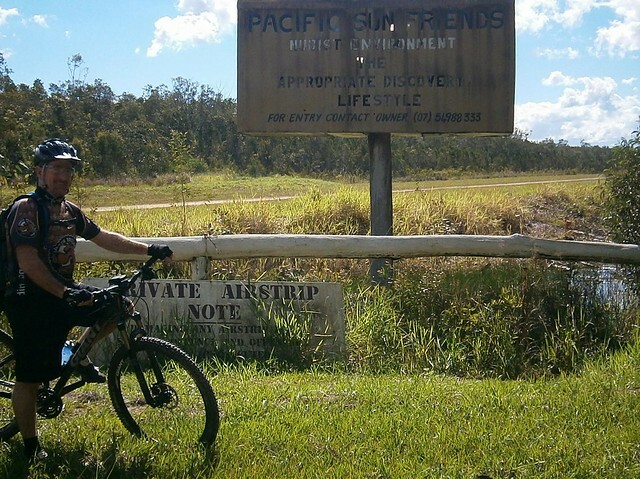 My friend Tony has been holidaying near the beach at Beachmere, so we decided to ride from there to Wildhorse Mountain and back. 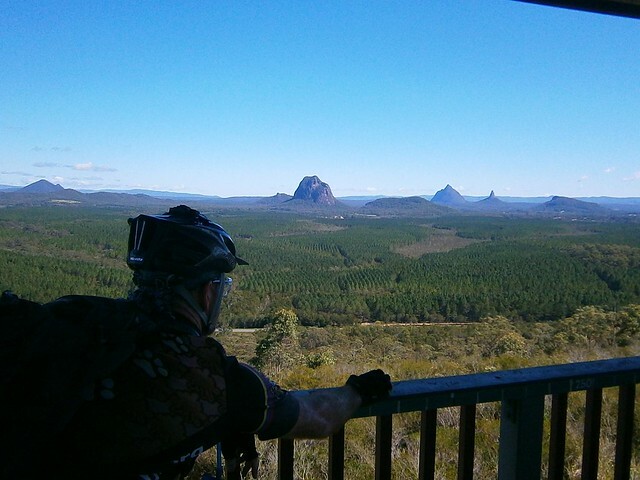 It involved about 80km of fairly flat trails through the pine plantations heading north towards a spectacular lookout that offered great views of the Glasshouse Mountains. 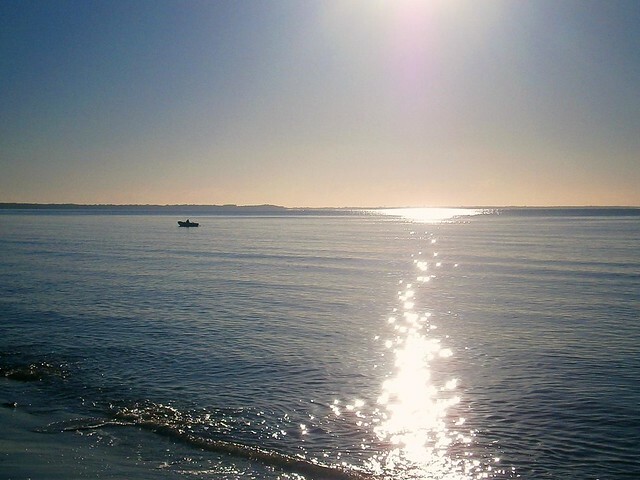 As its name suggests, Beachmere is right on the beach near where the Caboolture River meets Deception Bay. It’s a quiet place with beautiful views across the water towards Moreton and Bribie Islands. Just north of Beachmere is the town of Ningi, named after the Ningi-Ningi – a coastal dwelling Aboriginal group. One of the most famous Ningi-Ningi people was Ker Walli, also known as “King Sandy”, who was born in this area in the late 1830’s and was leader of the local Ningi-Ningi from about 1864 until his death in 1900. He was a good friend of local settler Tom Petrie whom he helped in harvesting timber on the Mooloolah River. In fact, Ker Walli thought so highly of Tom, that he carved the letter “P” in a circle on his arm with broken glass, and rubbed some charcoal in it to make a permanent mark. 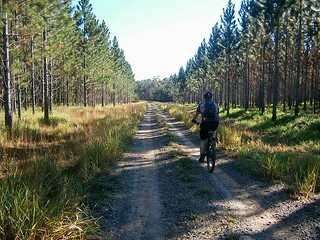 The pine plantations stretch northwards from here for almost 50km and the forests are criss-crossed by numerous dirt tracks and gravel roads. 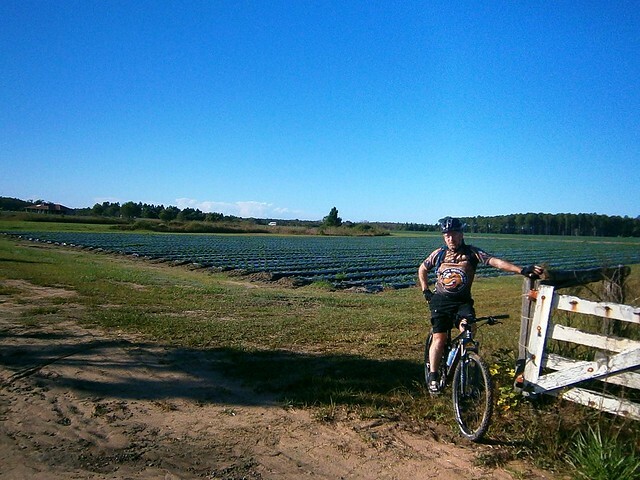 There are also several strawberry farms, and poultry farms. 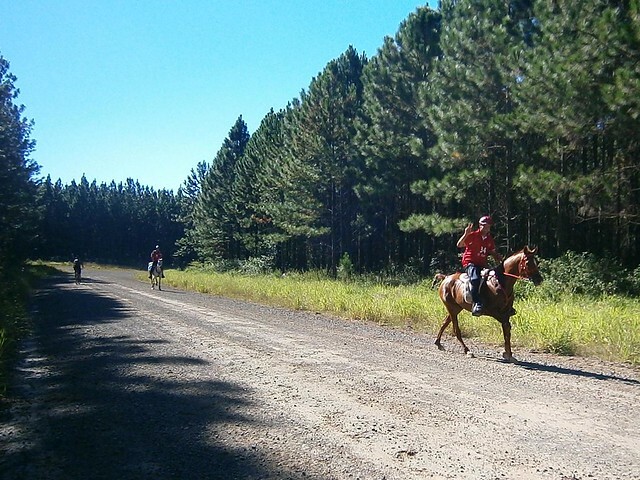 We encountered numerous horse riders in the forest. 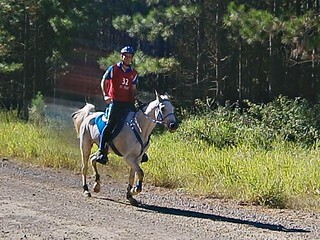 They appeared to be competing in a cross-country horse race. The pace was relaxed enough for most of them to wave and greet us as they rode past. Recent rain flooded some of the causeways in the forest, and made a few places quite muddy. When I came to this causeway, I decided to scramble along the log in the background in an attempt to keep my feet dry. 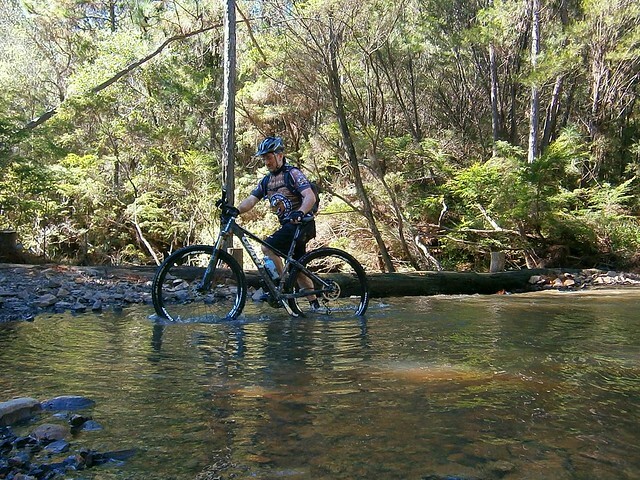 Tony was a lot tougher than me and just waded through the water. He also used it as an opportunity to wash some of the thick mud out of his chain. At the half-way point we stopped for a bit to eat at a cafe, then rode up on the only major hill of the ride – Wildhorse Mountain. 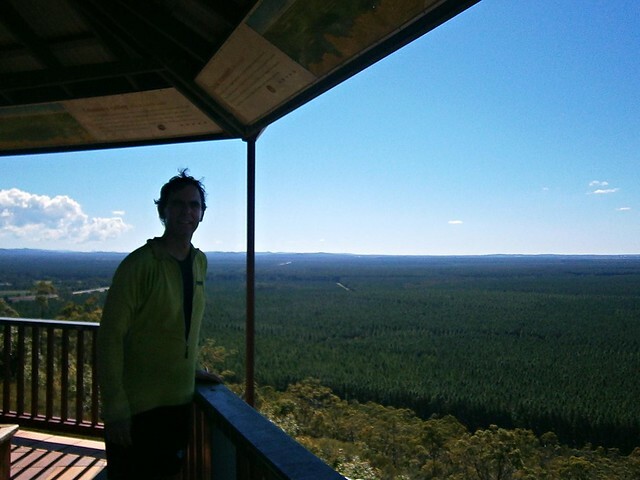 There’s a lookout at the top with some great views of the Glasshouse Mountains. You can also see out to east Moreton Bay, and can even make out the sky-scrapers in Brisbane to the south. On the way back we took a short cut along an old dirt road which eventually deteriorated into a cattle track through shoulder-high grass. When we came out the other side we found ourselves in a Nudist Retreat. The members were quite friendly and didn’t seem to mind us passing through. Tony and I decided to keep our gear on, as I imagine it wouldn’t be very comfortable riding a mountain bike naked. 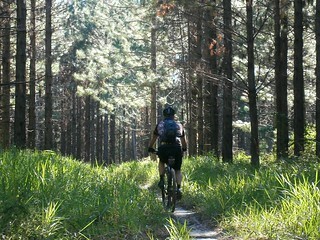 This ride was about 83km, with about 500m of vertical ascent. It took about 5 hours, and I burned about 4,000kcal. I’d rate this one about 7 out of 10 on the tough-o-meter. The weather was perfect (low 20’s). In drier weather it would be even easier. The mud made us work a bit harder than we otherwise would have. No pics from the nudist retreat? Do you have a GPS so you can follow the route? 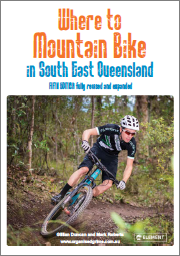 This will help to make sure you don’t get lost in the forest because there are heaps of routes in there. Basically, the green paths on my map help you avoid going through (1) the horrible bog near the chicken farm in the middle of the course and (2) The nudist resort which is private property and involves riding through some thick grass. Wildhorse Mountain is a good location to arrive at MID ride as the petrol station has lots of cafe’s for you to fill up at. That makes more sense than actually starting from there, as there’s no other shops in that part of the world. 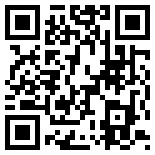 If you’d like GPX files or more route alternatives, please let me know. PS You could also start from Bribie Island Road. Hahahaha – they were a bit long in the tooth, but at least they were friendly.